Learning to fly like a circus performer on a trapeze is great fun and good source of exercise. Enjoying lessons on the flying trapeze gives you the skills to fly in a safe and exciting environment. 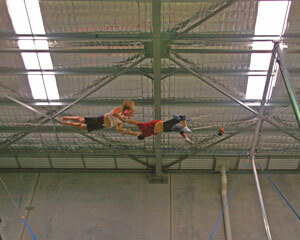 Trapeze lessons are available at trapeze schools and circus schools across Australia. Learning the trapeze or circus school in Sydney, Brisbane, Hobart, Melbourne, Perth, Darwin, Adelaide and Canberra can all offer you the training needed to learn the trapeze and other exciting skills. So learn to fly on the trapeze and start acting like a true circus performer. Be unique and become a master of the flying trapeze. Here's your chance to learn some new party tricks! This eight week course is an introduction to circus and aerial skills. You will learn trapeze, rope and tissue skills as well as juggling, acro-balance, acrobatics, hula hoops and mini-trampoline. Now you're ready to run away with the circus! Here's your chance to learn some new party tricks! This eight week circus skills course is an intro to circus and aerial skills. You will learn trapeze, rope and tissue skills as well as juggling, acro-balance, acrobatics, hula hoops and mini-trampoline. Now you're ready to run away with the circus! Challenge yourself and maybe another friend to the most exciting workshop ever to hit the big top! Join us for a private circus skills workshop, which will see you clowning around as you try balancing on the tight wire, juggling or flying on the trapeze! Create and star in your very own circus! Experience a unique circus skills workshop offering participants of all ages and abilities an unforgettable introduction into a wide range of circus skills. Participants will be encouraged to be creative, challenge themselves and have fun together. Create and star in your very own circus! Experience a unique circus workshop offering participants of all ages and abilities an unforgettable introduction into a wide range of circus skills. Participants will be encouraged to be creative, challenge themselves and have fun together. Ever dreamt of flying? Well, the closest thing to flying, could be swinging on the flying trapeze! You and a friend can join us for a circus skills workshop which will see you conquering heights and swinging with ease on the flying trapeze! In the flying harness you'll fly through the air with the greatest of ease! Experience the adventure of the circus on a flying trapeze in this circus skills workshop. Learn to swing, leap and catch your way through a series of manoeuvres, all under the instruction of professional trapeze artists. Ever wanted to run away with the circus? You can come and try your hand at all things trapeze. If swinging from a trapeze rig sounds like fun, then you've come to the right place. Enjoy 90 minutes of pure adrenalin swinging fun with personal tuition from your experienced instructor! Experience the thrills and adventure of the circus during this Flying Trapeze Circus Skills Workshop For Two in beautiful Byron Bay. Swing, leap and catch your way through a series of manoeuvres, all under the instruction of a professional trapeze artist, and feel your body and spirits soar! Ever wanted to run away with the circus? You and a friend can come and try your hand at all things trapeze. If swinging from a trapeze rig sounds like fun, then you've come to the right place. Enjoy 90 minutes of pure adrenalin swinging fun with personal tuition from your experienced instructor! Fly through the air with the greatest of ease! Experience the thrills and adventure of the circus on a flying trapeze in this circus skills flying trapeze workshop. Learn to swing, leap and catch your way through a series of manoeuvres, all under the instruction of professional trapeze artists. 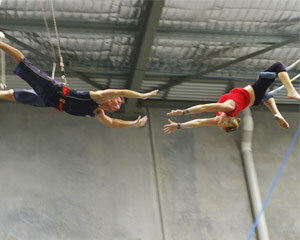 2hr Flying Trapeze workshop which includes learning basic tricks/skills on the Flying Trapeze. Once the trick is mastered, participants will attempt to be caught by the catcher. Workshops also includes live video recording and playback as well as trampoline. Challenge your team to the most exciting event to hit the big top! Join us for a circus skills workshop, which will see your group removing trust barriers, participating as a team and generally clowning around as they try the flying trapeze, juggling and even a tricky balancing act on a unicycle! Give your group a fun and interactive team building experience! Your team will get to join us for an exciting and liberating circus skills workshop with the flying trapeze and circus skills to improve communications, interaction and team cohesiveness! Ever wanted to run away and join the circus? Learn how to fly on the trapeze at an indoor flying trapeze school in Sydney and get a taste of what its like to be a trapeze performer!